Despite its current popularity with fashion photographers, Wonder Valley can feel godforsaken on a hot summer day. It was just such a day when Joe Barrett huddled beneath a shade canopy and sent his drone into the sky to take photos of an abandoned five-acre homestead. The original shack was busted up; no one had lived there for decades. But a neighbor had noticed–while browsing Google Earth–that there appeared to be rows of stones arranged to form words. Big words. They were hard to make out from the ground so Barrett and his drone were enlisted to see what was there. As an image came into view on his small screen, he saw what looked like a huge mushroom etched with letters. “I could see it was something awesome,” Barrett said. Barrett had been needing something awesome. A veteran of the film industry in LA, he’d been diagnosed with a rare neurological disease, Transverse myelitis, and had temporarily lost almost all his mobility. Like so many before him, he retreated to the desert to recover. 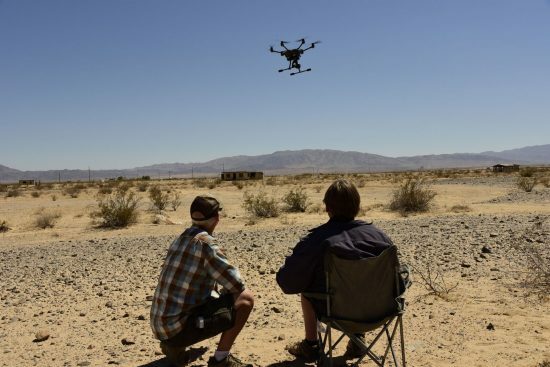 Living in Yucca Valley, he’d taken up drone photography. His recovery was about to get a big assist from a homesteader named Hazel who died in 2012. Once the drone came back to earth, Barrett drove home in a state of anticipation. As he photo-shopped the images, what emerged was the secret garden of Hazel Iona Stiles (1913-2012), a hitherto unknown piece of land art. 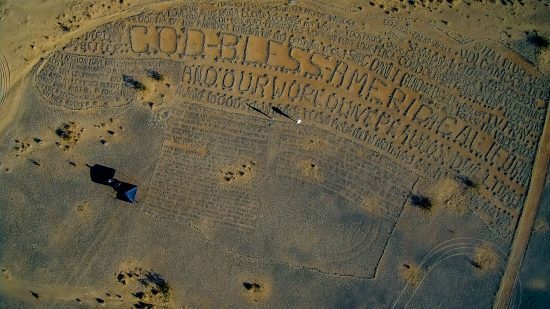 At 300 feet by 180 feet, it covers a bigger footprint than Salvation Mountain (Leonard Knight’s popular creation near Niland) with a similar flavor of visionary folk art. Hazel Stiles’ stone garden. Drone photos by Joe Barrett. 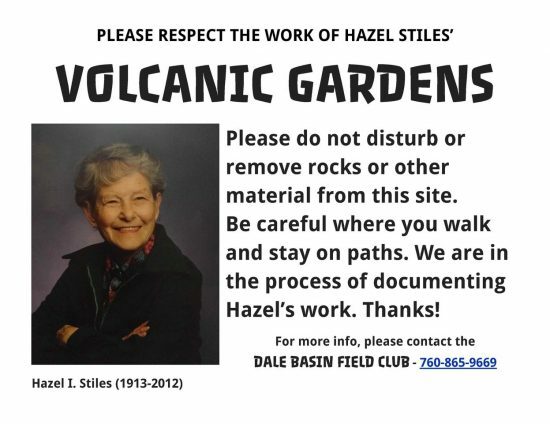 Even Hazel’s son, Jack Stiles, did not know what his mother was up to. When shown a photo of the artwork for the first time, the Castro Valley resident seemed bemused and said his mother was always one for hard work in the garden. Hazel was gardening, but on a celestial, or possibly intergalactic, scale. She was born in Brownsville, Texas and later lived in Los Angeles, where she worked as a conductor on streetcars and then as a Rosie the Riveter in an aircraft factory during the war. She had three sons, Jack, Edward and Robert. Only Jack survives her today. She moved out to remote Wonder Valley in the 1960s after a divorce. In a photo taken around that time, she appears confident and somewhat playful despite the fact that home was a primitive cabin with no electricity and no water. “It was not livable, really,” says Jack Stiles, who visited before the rock garden was in full bloom. Hazel was a student of Christian Science–a metaphysical movement that reached its peak of popularity at the time she was a young woman in the 1930s. She tried her hand writing on spiritual themes. “She did a lot of writing but I don’t think it went anywhere,” says Jack. The shift to writing in rocks may have been just another way to get her message out. Hazel began sorting and stacking piles of rocks around her property. Some of the rocks appear to be lava imported from the Amboy Crater. She spray painted some rocks and painted dots on others, starting work on her stone garden in the early 1980s–the same time Leonard Knight was busy building his mountain near Niland. Ken Sitz–the man who discovered the work via Google Earth–observed that Hazel’s work resembles a giant Dr. Bronner’s bottle. Beneath the large letters are what appears to be smaller text, but the words are unreadable, perhaps erased by wind or floods. 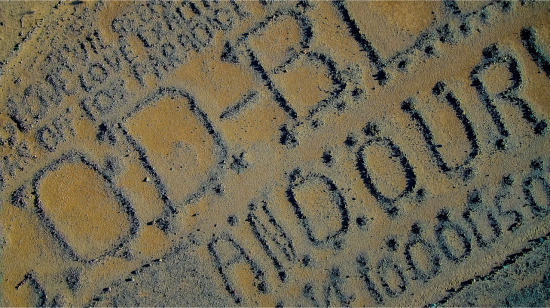 Sitz, who calls the creation Volcanic Gardens, speculates there may even be a secret code embedded in the small dots. Hazel must have made thousands of trips over many years–choosing stones and pacing back and forth under the brutal sun–to spell out the riot of messages that run together in one jubilant rush. This is not the work of a morose hermit but an ecstatic messenger telling us to Sing Dance Pray and Turn off TV. Sermons in stone, and good in every thing. A mystery: Who was Hazel Stiles addressing with her words? The letters are so large that the manifesto can only be seen from the air. The shack is on a major flyway into LA. In her isolation–and given her background building airplanes–Hazel may have been watching the contrails and fashioning messages for air traffic. Or, given the UFO culture in the Hi Desert, it’s possible she had a outer space audience in mind–though there is no evidence of that so far. The site has been protected until now by its ground-level invisibility and remote location. The fading of the original paint adds to the protective coloration. “The only reason it’s still there is because nobody saw it,” says Barrett. But the moment the drone revealed the splendor of Hazel’s Garden, it was at risk. It’s an extremely fragile environment. Off-roaders have already left their tracks. One misplaced footfall can disrupt a quote from Shakespeare. The carefully-placed rocks are portable and at risk of being carted off by selfie-tourists. “Ideally we can avoid it becoming another Hi Desert novelty and have it reflect and benefit in some way the Wonder Valley community–which is fairly poor and hard scrabble but filled with a unique blend of long-term residents and relatively newer creative types,” he adds. He’s assembled an informal preservation group to do further research and protect the artwork, which is on private land. See Joe Barrett’s drone photos of Hazel’s Garden at the Wonder Valley Community Center, opening August 4, 2018. A sign Ken Sitz posted at Hazel’s place. Please help preserve this homestead art. Another really interesting read. Who would have guessed? It must have been a thrilling discovery and it needs to be preserved. Thanks. Another example of hidden desert magic. Ineffable energy out there. Hazel felt it and put the message in stone. “Wonder Valley”–been there, perfect name. Thank you Anne for bringing this discovery to us. Where did she get the strength and inspiration to spend hundreds of hours in the blazing sun hauling rocks, alone with only her vision and mission? Desert is powerful. This is amazing…but…shhh – don’t tell anybody. Good luck with the preservation. Thank you Anne for sharing another discovery of our majestic desert. i “know” this article made hazel smile big! thank you for taking the high and less travelled article road,dear ann! Hazel was an explosion of FORTITUDE. What makes the desert so special is it’s purity. It is best left undisturbed. Lets not tarnish its beauty with gaudy narcisstic architecture, rusting “art sculpture”, painted rocks, indelible tire marks, silly mazes or windmills. I agree with you Fred. However, having seen Hazel’s garden, it’s very ephemeral. It’s already partly disintegrated and will eventually vanish. It reminds me of an Andy Goldsworthy sculpture–built for obsolescence. If you’re concerned with intrusive, gaudy art tainting the desert, you must be livid at DesertX. The internationally famous artist Jenny Holzer (a champion of the oppressed) intends to light up our local mountains in a six-day carnival (Feb. 2019) that will surely inspire many copycats. Artificial light is devastating to wildlife. DesertX is part of a global industry. There are more than 250 such art biennials worldwide who take over locations and erect temporary theme parks at the expense of the locals and the environment. The X stands for Xploit. Sorry to hear about DesertX. Illuminating the hills with artificial lights is just aesthetically cheap when compared to the natural tapestry of the desert illuminated by the sun and the moon. I guess there is no limit to how some people can impose their ill conceived wills on others.